Scabbing - SCABBING: stiple spirit gum on the area and let dry. Stiple REEL Old Dried Blood on top. It will crackle just like a scab. 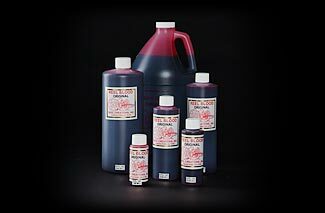 REEL BLOOD is the product that started REEL CREATIONS,Inc. REEL BLOOD is the most realistic, most photographed, most popular artificial blood in the entertainment industry. REEL BLOOD Original Formula is the most frequently used,however, it also comes in LUNG BLOOD especially formulated for dark skin, dark clothes or dark surfaces and AGED BLOOD which is a darker shade of the original formula so it still flows but is beginning to turn brown. REEL BLOOD is the most user friendly and most washable artificial blood on the market. WARNING:Not to be ingested. Use in the mouth is OK provided it is spit out and the mouth rinsed with water. Do not use in the eyes or other open orifices of the body. Not for body contact recirculation systems (i.e. showers) bacteria contamination will occur. Once used--discard.